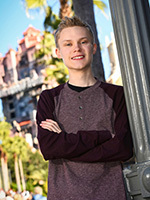 Matthew's goal is to be a Walt Disney Imagineer, designing attractions for the Disney Parks. He has always cared deeply for the environment because it serves all living things. Without a healthy environment, nothing can thrive. He believes that we must all do our part to take care of the planet. 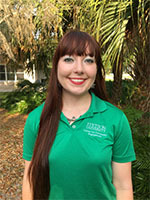 As the first environmental fellow, Sarah works to mentor the younger fellows to follow their passions and to become better leaders in the Stetson community. She is an environmental science and geography major who is passionate about implementing social and behavioral change using an interdisciplinary approach. Sarah is particularly interested in environmental justice issues as well as the bidirectional relationship between industrialized food systems and climate change. With the support of her professors, she became a 2016 Udall Scholar for her environmental initiatives and engagement with the Stetson community. She is also a 2017 Campus Compact Civic Newman Fellow due to her social justice activism in the community. In the future, she hopes to help build sustainable communities and include all people, especially the indigenous, as a part of the solution.